Delicious birthday fruit cake includes knife, ice cream accessories, cutlery accessories, pudding, cookies, fruit pieces and many more. Improves hands on skills and creativity and has eating utensils such as a fork and knife a great treat for every teddy bears picnic or with a cuppa for mummy. Great toy for role play. Amazon is selling Saffire Musical Diy Birthday Cake Toy (75 Pieces) at Rs 599. 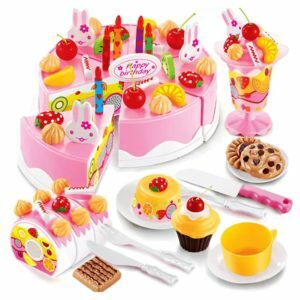 How to buy Saffire Musical Diy Birthday Cake Toy (75 Pieces) at Rs 599?